Seventy years ago when architect John Creutzer designed the Julie Apartments on Ninth Avenue and Virginia Street, there was a lot he couldn't have known about the building. He didn't know, for instance, that it would be one of Seattle's last structures to be built before the Depression hit. After 30 years of designing buildings in the city -- including the Medical & Dental Building on Olive Way -- he also didn't know the apartments would be his last project before his death in 1929. And he didn't likely foresee that the building -- designed as a swank residence for single young professionals working downtown -- would be declared a National Historic Landmark at the end of the century, and then renovated for 47 units of low-income housing and a public shower/restroom facility. But that's what is about to happen. Having spent nearly a decade deliberating with city officials, and downtown business and property owners about how and where to build a hygiene center -- the Low Income Housing Institute will break ground Tuesday on the approximately $2.7 million project. The 70-year-old Julie Apartments, recently listed as a National Historic Landmark, will be renovated for 47 units of low-income housing and the Urban Rest Stop -- a hygiene center. LIHI will own and operate the shower facility, called the Urban Rest Stop, as well as the apartment units. Buchanan General Contracting is the general contractor. Architect Les Tonkin of Tonkin/Hoyne/Lokan, who lobbied the federal government to list the building as a National Historic Landmark, says his work preserves the Julie's original mix of art deco and classical themes, while accommodating the needs unique to a co-ed public shower. "The building design and the architect himself fascinated me," Tonkin said. "Although classical styles -- with Greek and Roman touches -- were more common at the time, this building is a hybrid example of art deco and classical motifs." Tonkin's plan retains the terrazzo floors in the individual units, mission-style tiles, and cast-stone work that simulates stone-carved geometric shapes and flowers. He said the building's "fun street facade" will also stay intact. All 47 studio units will be renovated, and at least seven will feature the original kitchen cabinets and plumbing work. From a civic point of view, however, the Urban Rest Stop promises to be the most remarkable feature. The bathrooms and showers will be housed in the basement of the structure, and a common area with laundry facilities will be located in two of the first-floor retail bays. An existing grocery store will keep its space in the third bay. The basement space will be split up into several individual bathrooms equipped with showers, a toilet and sink. The doors will have locks and, for safety and convenience purposes, the facility will have several staff, Tonkin said. Tonkin added there's a natural separation between the Urban Rest Stop, grocery store and apartment units. The apartments have a separate street entrance that bypasses the retail bays. From the street, the hygiene center will look like a retail storefront. The facility will even be pretty, LIHI officials said. "It's going to be quite beautiful," said Ronni Gilboa, a project manager for LIHI. "Lots of tiles will line the showers, and so forth. We really kept an eye toward appearance, while considering durability and making the bathrooms easy to clean as well." General design and layout ideas were garnered during tours to similar facilities in Vancouver, B.C., Gilboa said. She noted that the concept of a public restroom/shower facility isn't novel, and is past due for a city the size of Seattle. "Thirty years ago when I went to England they had public restrooms and showers. They have them in Rome and in Paris and there's no reason why we can't have them here, too," she said. Currently, the Seattle Public Central Library and the Municipal Building are downtown's only publicly-owned buildings with public bathrooms, according to Gilboa. 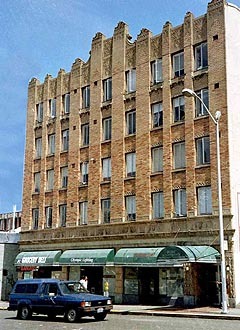 Three years later, the non-profit group bought the Glen Hotel on Third Avenue and Pike Street with the idea of putting a hygiene center in that building. However, after nearby merchants and property owners filed a lawsuit to block the project, LIHI resumed its hunt for a suitable building. "The Downtown Seattle Association filed a NIMBY suit against LIHI and the city, because members didn't think a hygiene center would work with all the new development downtown," Gilboa said. "But after several years of really difficult negotiations, we've come up with plan that works for everyone. The DSA has since been very supportive." As part of a settlement agreement, the DSA gave $250,000 toward renovation work on The Julie. The city kicked in $2.6 million to purchase the building and site and will give several hundred thousand dollars more toward renovation work and operational costs, according to Gilboa. She added that the building's location will be a huge boon to patrons. It's only about a block and a half from the convention center bus station, a few steps away from the new Seattle Police Department precinct and about three blocks from a center for homeless veterans and a public sobering center, she noted. Gilboa said there won't be an "income-check" at the door. Anyone can use the facility. Barring any construction delays, the Urban Rest Stop should be in operation by January. The residential units should be ready by late summer, according to LIHI officials.